Simplicity at its best. A weekend treat worth doing! In the bowl of a stand mixer fitted with the whisk attachment, begin beating the eggs on medium-high speed. Slowly add in the sugar while beating and continue to beat until the mixture is pale and thickened and ribbons down from the beater when lifted before settling back down into the batter. Wipe down the bowl and beater as needed. Add the dry ingredients to the wet and fold in just until only a few visible streaks remain. Add in the chocolate and chopped almonds and fold in just until all ingredients are evenly incorporated. Spoon the batter evenly into the prepared muffin cups, smoothing the tops if needed but keeping the scoops mounded. 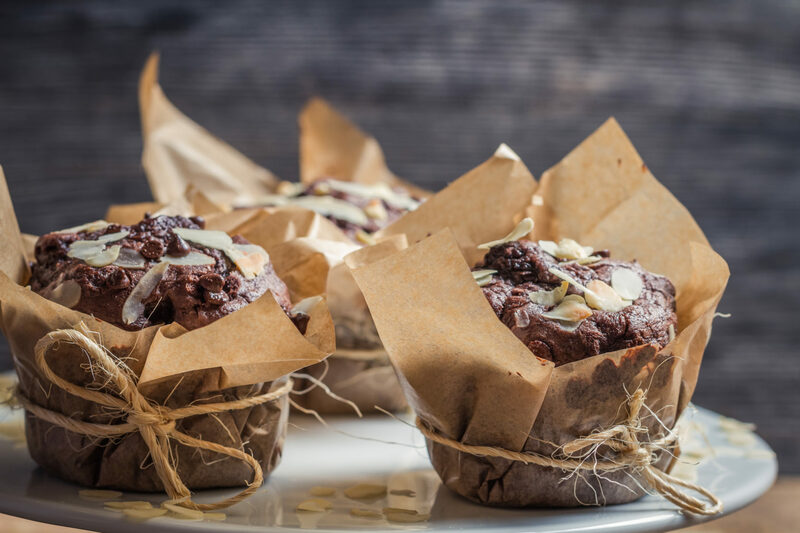 Bake muffins in a preheated oven for 10 minutes, and then reduce heat to 170ºC and bake another 5-10 minutes, until a toothpick inserted into the center of one comes out free of wet batter (it may come out with melted chocolate). Cool muffins in pan for about 15 minutes before transferring to a wire rack to cool completely.